If you read any celebrity columns, you may have seen a lot of coverage on the "Divergent" film cast in the past two weeks, and -- in particular -- actress Shailene Woodley's somewhat controversial comments on her natural beauty regimen. Some of her comments were kind of "out there," like how she thinks sunning her nether regions is an instant perk-me-up, how she only washes her hair once a month, and how she eats clay to cleanse her insides. Woodley says she's been studying indigenous lifestyles and herbalism as a teenager, and I'm sure these things have scientific bases and do work, but I'm definitely not about to pull out a chair and sunbathe naked in my backyard for my neighbors to see anytime soon. One thing Woodley mentioned sounded interesting to me, and that's oil pulling. Oil pulling is an Ayuredic practice that dates back 3,000 to 5,000 years, and is thought to improve both oral and systemic health. On a basic level, plaque and some bacteria are oil soluble, so will dissolve in oil. But more broadly, oil pulling supposedly pulls toxins from the bloodstream and helps with a number of conditions, including headaches, arthritis, eczema, liver problems, etc. I'm not quite sure how that works, but the Medical Director of The Chopra Center for Well-Being, Dr. Sheila Patel, told The Daily Beast that “We know there’s definitely a link between poor dental health and heart disease." On a purely superficial level, it's supposed to make teeth whiter, and that was enough of a perk for me to try it out. Not having to resort to those $40 a box Crest Whitestrips that make my teeth feel extra sensitive and make my teeth more vulnerable to stains in the long run? Sign me up! So what oil pulling actually involves is an amount of oil (typically one to two teaspoons) swished around in your mouth for 20 minutes. Shailene Woodley mentioned you can practice oil pulling with either sesame or coconut oil, but I'd imagine other oils would work as well. I happen to have a large amount of coconut oil lying around, so I decided to give it a go. Straight off the bat, I knew I'd used too much. I put a tablespoon of coconut oil into my mouth and almost immediately felt like I wanted to gag. The texture was really not pleasant, as you can imagine. The oil took quite a while to dissolve, and when it finally did, I realized that I should've used a smaller amount, because my mouth was so full I could not "swish" the oil around. I tried to swish for 20 minutes, but since you're not supposed to swallow, saliva collects with the oil over time and increases the volume of liquid in your mouth. I lasted about 12 minutes. The second time I did it, I used one-and-a-half teaspoons of coconut oil, and I still had a bit of a inclination to gag, but it was a ton better than the previous time. I lasted about 13 minutes, and I noticed that my teeth were indeed whiter. On top of that, hard-to-reach plaque I'd been unable to remove through brushing and flossing had dislodged themselves! I've been doing it for just over a week now, every other day, and I've gotten used to the feeling of waxy coconut oil dissolving in my mouth, and I've been able to swish for 20 minutes without much issue. My teeth do definitely look whiter, and I feel that my mouth is more hygienic. 1. If you're going to use coconut oil, do not spit the remnants of your swishing down a drain. 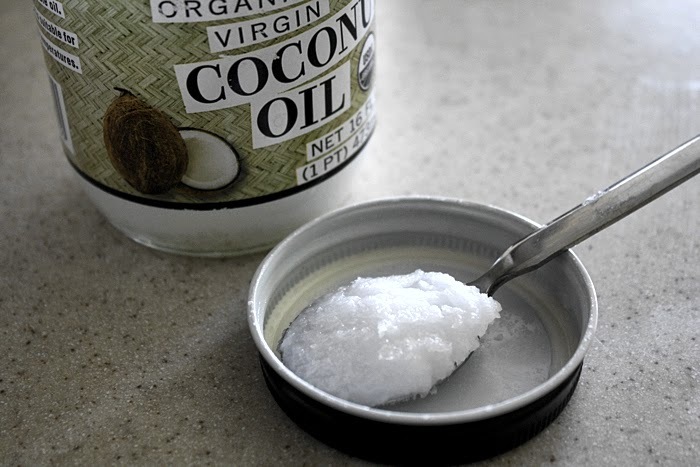 Coconut oil solidifies at 77 degrees Fahrenheit and will likely clog your pipes. Instead, spit it into a trash can. 2. Try to use an oil with specific antibacterial properties, like coconut or sesame oil. 3. People who have been practicing oil pulling for a while recommend doing it first thing in the morning, before eating. 4. Some people seem to have had some initial adverse effects to oil pulling, such as congestion and headaches. For me, I may or may not have experienced a teeny bit of "unclogging" of mucous, but it wasn't so noticeable that I thought it had anything to do with allergies or the changing of seasons. Also, to me, this seems like a way of breaking through congestion -- a good thing, right? 5. If you don't like the idea of melting a waxy oil in your mouth, I would recommend using sesame oil. The flavor may be slightly more intense, but it shouldn't be as gag-inducing in the initial stages. One study showed that sesame oil decreased bacteria five-fold, while coconut oil managed a two-fold decrease. Have you tried oil pulling? What oils do you use, and what sort of health benefits have you experienced? + The Daily Beast: Oil Pulling: Miracle Cure or Oily Mess? These are very useful tips for DIY teeth whitening, but we should not underestimate the importance of dental check ups. We often think that dentists are concerned only about the mouth i.e. pulling and cleaning teeth,bad breath and other aspects of dental care. But sometimes dentists can detect life threatening diseases even before physicians - including cancers and diabetes. Back in 2007 Harvard School of Public Health published results of a Health Professionals Follow-Up Study (HPFS). HPFS examines health issues in physicians and other medical scientists; in anutshell the Harvard study showed that health professionals who did not take proper care of their oral health were at higher risk for pancreatic cancer than health professionals who did care for their teeth. Another study coming from scientists at Case Western Reserve University found that a chemical released from a bacteria named Fusobacterium nucleatum that increased the risk for colorectal cancer. F. nucleatum generally stays in the mouth but if gets to other parts of the body and release that chemical it can be very serious. Dentists help detect the presence of these germs. Also, scientists at the College of Dental Medicine have developed an early detection diabetes method. They found that the number of missing teeth could serve as an early warning for diabetes and pre-diabetes. So, as you can see, we should never underestimate the importance of good dental care. Have a good day. And keep writing your posts, they're very interesting to read.